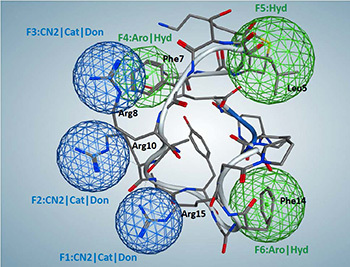 Ribbon diagram and three-dimensional residue structures belong to superimposed catestatin. Image courtesy of Valentina Kouznetsova, UC San Diego. Authors include SDSC’s Tsigelny, O’Connor, and Kouznetsova, as well as Nilima Biswas and Sushil K. Mahata, of UC San Diego’s Departments of Medicine and Pharmacology.